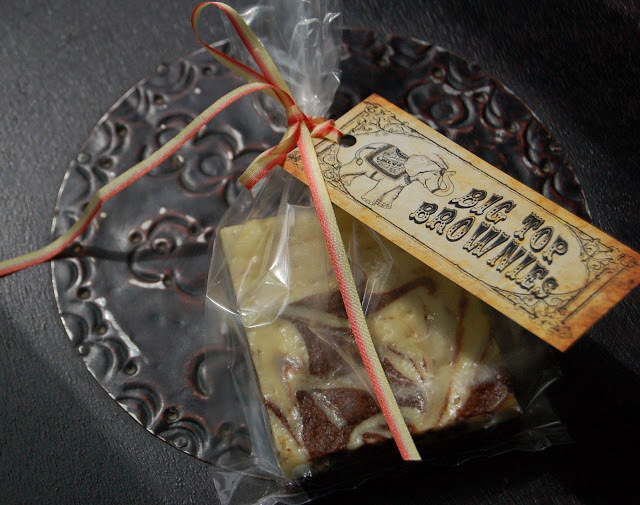 Get your Big Top Brownies here! Big TOP Brownies, BIG Top Brownies, BIG TOP BROWNIES! This swirly creation is one of Alice Medrich's recipes, although I found it on The Joy of Baking website. Leave it to the Queen of Bittersweet Chocolate to come up with this irresistibly creamy and dense fudge-like bittersweet brownie. This recipe calls to all cheesecake lovers, but a warning, must love chocolate too! One of my client's has a school Circus to attend this weekend and wanted to bring along bakesale goodies. Travis helped design a vintage circus label and he had a BIG part in the name. So here it is, my Big Top Brownie all dressed up and ready for the Circus.